When we were at school, all the cool kids rocked up to class wearing a pair of hulking great Cat boots. Were they working on building sites in between English and double maths or something? Who knows? But now, those 90s trendsetters can relive their dead leg-giving heyday (Bitter? Us? Never!) by picking up a rugged Android handset from the celebrated manufacturer of tools and diggers. 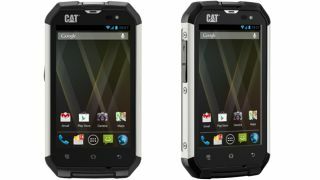 The Cat B15 smartphone is available to buy in the UK now from Unlocked-Mobiles.com for the sum of £299 English pounds, which sadly is more than the boots. For their money, they'll get a 4-inch display, Android 4.1 Jelly Bean, a 1GHz dual-core processor and a 5-megapixel camera. The basic specs are, naturally, quite modest, but it's this device's toughness that'll see it migrate to the pockets of rough and tumble sorts across the nation. "Cat is a well known brand for making high quality clothing and tools which can be put through their paces in extreme conditions. When designing a smartphone, CAT has not compromised on such features. The B15 from Cat will take high levels of wear and tear, is waterproof and drop proof, which will allow you to nearly always be in contact, whatever the conditions. The IP67 certification enables the Cat B15 to be immersed in 1 metre of water for upto 30 minutes and withstand a 1.8 metre drop," the listing claims. The launch of the B15 places it in direct competition with a year-old JCB Toughphone Pro-Smart which only offers Android 2.3 Gingerbread and a single-core 800MHz processor.